K9 Veterans Day is celebrated on March 13th, which is the date that the US Army K9 Corps was founded in 1942. It’s a chance for us to honor the four-legged heroes who help serve our armed forces and keep our troops safe. K9 handlers in the military can tell you how dedicated these dogs are to doing their jobs and protecting the members of their teams. They should be honored alongside our human troops, and K9 Veterans Day is an opportunity for us all to remember and reflect on the invaluable contributions these dogs make. Here are five out of the countless dogs who deserve to be celebrated for their service on K9 Veterans Day. Cena the black Labrador Retriever formed a special bond with his brother in arms, Marine Corps Lance Cpl. Jeffrey DeYoung. They served together on a seven-month tour of duty in Afghanistan back in 2009, where Cena kept troops safe as a bomb-sniffing dog looking for IEDs. 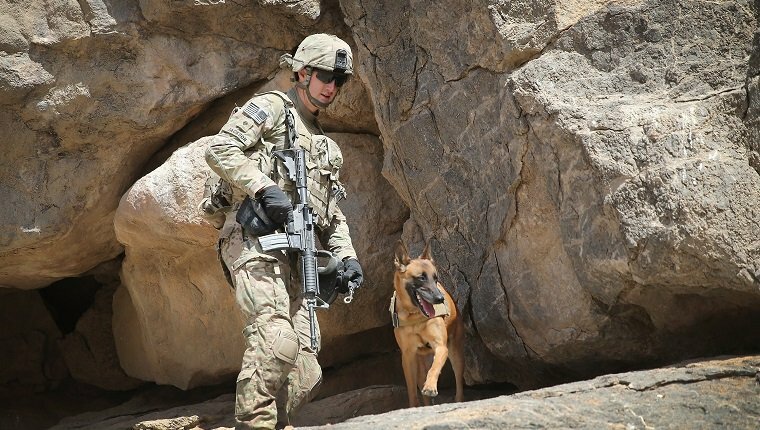 Other soldiers who worked with Cena described him as more like a kid or a brother than just a dog, but it was DeYoung’s connection with the pup that led him to adopt Cena in 2014 after Cena had gone through a year of rehabilitation therapy. Their work together wasn’t done, however, as the two traveled across the country and even to the U.S. Congress to discuss the importance of bringing war dogs home to retire and live out the peaceful, happy lives they so deserve. Cena passed away from bone cancer in 2017 and was laid to rest at the Michigan War Dog Memorial, where he was honored with a military color guard, bagpipers, and a howling salute from six German Shepherds who are part of the K9 Salute Team. Around 600 people attended the funeral. Staff Sgt. Isky Brown completed over 300 missions with his human partner, Sgt. Wess Brown. They traveled the world as a bomb detection team, providing service to military generals, the Secretary of Defense, and even President Obama, but in 2014, one of their missions quickly became even more dangerous. They were deployed to a small province in Afghanistan, and after finishing their bomb search, they suddenly found themselves being fired on. With bullets flying around them, the two bolted up a set of stairs on their vehicle, but Isky slipped and broke his leg in six places. They were evacuated, and Isky went into surgery. The veterinarians would have been able to save Isky’s leg, but the x-ray revealed that the leg also had a tumor that, if it weren’t discovered, would have spread to the dog’s brain and killed him within six months. He would have to lose the leg, but Isky’s partner knew right then that he would take the pup home to live with him. He started the paperwork right away. Now Isky is enjoying retirement, and he doesn’t seem too upset about losing a leg. Isky certainly deserves the happy life he has with his favorite human. Max the Belgian Malinois served as an explosive detection dog with his partner, Master-At-Arms Chief Petty Officer Fabian Salazar. During their deployment to Afghanistan, Max saved the lives of many soldiers by going ahead of the troops and looking for IEDs. On one mission, Max and Salazar went into a Taliban compound before their unit to search for explosives. Max indicated that there was an explosive device around a corner that was rigged as a booby trap. Human soldiers would not have seen it, and Max surely saved lives that day. On another occasion, Max and Salazar’s unit were taking fire, and while Salazar was focusing on the enemies in front of him, Max reared back and pulled on his lead. That’s when Salazar noticed an enemy combatant sneaking up on them from behind. He would have never seen the attacker if Max hadn’t warned him. Max likely saved the lives of several soldiers who would have been caught off guard by the enemy. The pair received multiple awards for their heroism, and they were both even promoted for their merit, but eventually Salazar was reassigned and the two parted ways. Luckily, Max’s handlers kept in touch with Salazar, and he was able to adopt Max when the pup finally retired in 2017. These two will be able to live out their days together in well-deserved peace. Rocky and his partner, Specialist Andrew Brown, were serving in Afghanistan when they were injured by shrapnel in the blast from an IED as they were searching a compound in 2015. Brown and Rocky were awarded Purple Hearts for their service after being flown to Kandahar for treatment, but they were separated as Brown was flown to the U.S. while Rocky stayed in Europe to recover. Several months later, they were finally reunited in Maryland. It was the longest that the two had ever been apart since they became partners. So, of course, they were very excited to be together again. The photos of the two recovering together went viral. Rocky is considered a full soldier in the military, and his rank is actually one above Brown’s. Rocky suffered a broken femur and tail injuries, and it was unclear if he would return to duty. However, Brown made it clear that he and his family were ready and willing to take Rocky home. They wanted to let him live out his life in peace. Unfortunately, I couldn’t find any stories that followed up with how Rocky was doing or if he returned to service. Hopefully wherever he is, he is safe and still looking forward to seeing his partner again. Sgt. Rex, a bomb-sniffing dog, went on more than 100 missions with his Marine partner, Cpl. Megan Leavey, when they served in Iraq from 2003 to 2006. That was before they were both injured by a blast from an IED. Leavey was left with hearing loss, brain injury, and PTSD, while Rex suffered a shoulder injury and neurological problems. After a year of rehabilitation, Leavey was honorably discharged, but Rex was still needed by the Marines. Leavey desperately wanted to adopt Rex, but government red tape and bureaucracy wouldn’t allow it. Still, Leavey kept checking up on Rex wherever he went until she got a call that changed everything. Rex was sick. He was dying of cancer. Leavey immediately renewed her efforts to adopt Rex so he could live out his days in a loving home. Rex was running out of time, and Leavey still ran into bureaucracy and difficulties that prevented her from adopting. However, this time she had help. Leavey and Rex’s story spread far and wide. Senator Charles Schumer circulated a petition that gained 20,000 signatures to help expedite the adoption process. Even the New York Yankees got involved to cover the costs of Rex’s transportation and medical care. Finally, Rex was reunited with Leavey, and he lived out the last eight months of his life surrounded by love. You may have heard their story, as it was made into a 2017 film called Megan Leavey. What other K9s should we honor on K9 Veterans Day? Let us know in the comments below.